Anfield of Dreams - LFChistory - Stats galore for Liverpool FC! In an age when it seems there are as many books published about football supporters as there are about the footballers those supporters watch so avidly, Neil Dunkin’s book, described on its front cover as “A Kopite’s Odyssey from The Second Division to Sublime Istanbul”, stands out. Any football supporter, not just a Liverpool supporter, who reads this book will understand why it was nominated at a recent British Sports Book awards. An articulate and respected journalist in his own right, Neil has no need of a ghost-writer or co-author. He opens his heart and allows the reader to share his extraordinary memories of a near fifty-year period. Anyone who lived through the same period … or even just some of it … will be both thrilled and enthralled by this remarkable journey. Neil grew up in an area off Breck Road nicknamed “The Lake District” because of the names of its streets. Living so close to Anfield that he could often hear the noise from the crowd, there was never much doubt that his allegiance would be Red rather than Blue, even though he was in the minority at his first school which was closer to Goodison than Liverpool’s own home. Post-war austerity didn’t prevent him from having a happy upbringing in a safe neighbourhood with a good community spirit. He remembers impromptu kickabouts with his mates in Stanley Park, in which the boys played with no proper kit until one of the lads thought of “an idea so outlandish it was at least worth a try”; they would go to Anfield to see if the club would give them any of its “old gear”. Neil was one of two boys delegated with this task. Once inside the stadium, the manager at the time (Phil Taylor) kindly greeted them and showed them around but explained that the club was unable to pass on any kit because after first-team use it was then handed down to the junior teams the club put out. So the end result was disappointment but Nothing Ventured, Nothing Gained as the saying goes. Neil’s ambitions to become a journalist saw him join the Liverpool Daily Post & Echo’s training scheme after passing his final university examinations in London. A regular hitch-hiker back to his home town during his student days, he was now able to attend matches more regularly, although he did not feel comfortable covering one home match from the Anfield Press Box because he couldn’t express himself the way he could on the Kop, somewhere he felt was his “rightful place”. He was therefore very close to the action as Bill Shankly’s plans started to bear the fruit of tangible success in the early 1970’s. Bill’s inspirational skipper, Emlyn Hughes, said of the 1971 F.A. cup final “We were all babies but we grew up as men that day”. “As a wind of change blew through L4’s corridors, the closing sentences of the Beatles’ lengthy chapter in cultural history were being written”. As the Beatles broke up, Liverpool Football Club was embarking on its own ‘lengthy chapter’ of success that would last for the next twenty years with Messrs. Paisley, Fagan and Dalglish continuing the work that Shankly had started. The club’s achievements are chronicled in numerous places other than Mr. Dunkin’s book. But it truly was a golden era the author was proud to be a small part of on such notable occasions as the European Cup quarter-final with Saint-Etienne in 1977 when “the Kop was the epicentre of an earthquake” after David Fairclough’s winning goal. Of the historic first European Cup win in Rome in 1977, Neil recalls “watching our splendid team process around the running track with that cup, our cup, I knew my lifelong dream had come true – nothing could better this”. Amazingly, it did get better as more memorable triumphs followed. Football, however, though important to so many, is only part of Life. Neil enriched his own life by travelling extensively, often to South America, describing Rio de Janeiro as a place “exhibiting obscene wealth cheek by jowl with abject poverty”. His love of football didn’t end at Dover or Heathrow and meant that he was able to watch matches live in both the awesome Maracana Stadium in Rio and the equally impressive Estadio Azteca in Mexico City. Back in Europe, an eye-operation prevented him from attending Liverpool’s second victory in Rome seven years after the first but he knew, as did anyone who was there, that “for Roma, the defeat was a humiliation that triggered a bloody sequel. Their hooligans exacted revenge in streets around the stadium, where Italian police displayed a reluctance to intervene”. Twelve months later, Neil saw for himself how “this violence (in Rome), unreported by Britain’s national media, was to have deadly repercussions”. At Heysel, on one of the darkest days any sport has ever experienced, Neil felt “deeply ashamed of the vile minority who’d latched onto my club and used it as a pretext for gratuitous violence that had caused deaths”. Around the time Neil was introducing his own son to the Kop, an even greater tragedy hit the club he loved, a tragedy he movingly writes about so well in a chapter called “Death In The Afternoon”. As a journalist himself, Neil was horrified to find that “Wapping’s falsehoods were disseminated across the world, doing incalculable harm to Liverpool Football Club and the city”. The First Division championship that came a year after Hillsborough was indeed the “last hurrah of a golden age”. Dunkin continues to bring us up-to-date with Liverpool Football Club’s life as well as his own. The travel stories, like exploring the Inca Trail in Peru and visiting Machu Picchu there, fit in neatly alongside the football stories without the reader losing interest. In some cases they are intertwined anyway. Even so far away from home, he finds that the influence of the Beatles is still alive for others than himself years after the group broke up. Despite leaner times, in terms of trophies anyway, “dark months are always brightened by trips to L4, one of the most bracing elixirs on tap, a release valve we’re so fortunate to possess”. Inevitably, there is a chapter about the “Immortality in Istanbul” and this is one of the most memorable accounts I have ever read of those extraordinary days by someone who was there. Arriving in Turkey early with his son because match-tickets were not yet to hand (they bought a pair for £500 the day before the final), Neil & Russ met fellow Reds from just about every corner of the globe, proving again “the aura and mystique that Liverpool has for men and women of every creed and colour. No other club casts such a spell; no other city stirs imaginations like it (Liverpool) does”. Using Neil Dunkin’s own words, “Liverpool’s half-century since the Fifties has been a unique saga that has encompassed the epic, heroic, dramatic, comic, poetic and lyric. 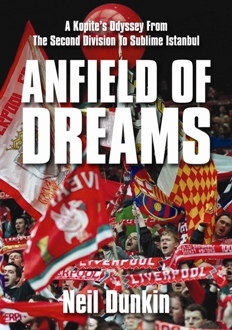 During those years, I have gone through every emotion that life can throw at you”; and of his own match-going experiences, he adds simply but passionately, “Nowhere, and nothing, equals it, because Anfield is my drug, the match my fix.” This excellent book is a truly wonderful account of those times and will warm the heart of any readers who were any part of it themselves and who can so easily relate to the stories and memories contained therein.